Headlines with a side of ... You have got to be f'ing s'ing me! Josh Beckett -- strikes out the first four batters. That apparently had not happened before. Guy should be the AL Cy Young Winner (not just for that, but for plenty more stuff). He's 4-0 in this postseason. Papi! Youk! Manny! Tek! JD! Jacoby! Lowell! I dunno, was anyone an 0-fer? 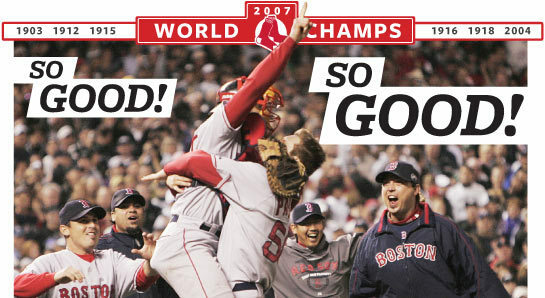 I know Youk and Papi came home (I went to bed when it was still 6-1). Final score: 13-1. Tied (?) for most extra-base hits ever in a World Series game (9, 8 of which were doubles, plus Pedroia's homer). The Sox are the new Yankees. Here's an article that puts it kindly. Dustin Pedroia -- just get that kid on base! Just don't ask him to make a face. he'll do anything to win. It's Manny being Manny, I know. He's definitely not your average Joe. Was it culture shock for Dice-K this year? will translating be his next career? He won the last game! What a difference for him, from last year. Why, it's his much-feared knuckleball! will his feat be repeated? "Jonathan, please don't quit your day job." I'd rate that at-bat a "ten"
How does he keep all that hair under his cap? what a great thing he did! man, don't that just beat everything? What can be said for Terry Francona? On my list of things to do before I die. Jespah may be buying us all dinner...I've heard a few "analysts" say CC Sabathia is most likely going to win the Cy. I obviously hope it's Beckett though. Gargamel, just like you want to hit Fenway, one of my goals is to go to a game at Wrigley. I've been down in the neighborhood in the offseason...maybe next summer. Garg, let us know when you're at Fenway (we might actually buy you a real dinner). We've had a blast every time we've gone there -- and the first time it was pouring rain (I had wet money in my wallet for weeks; it was that rainy) and they lost but it did not matter. Well, perhaps I'll buy a very small dinner for everyone. One pea enough for you? That's bad, though -- I realize post-season is not indicative for the Cy Young, but man! Beckett goes 4-0 and Sabathia is creamed in the ALCS. Plus Beckett is a 20-game winner in the regular season. What's CC got that Josh has not? I don't know, Jespah...but I've just heard a few sports personalities say CC may get it. I don't know why either. Ah, thank ya. Do you think it's too late to send cookies to the awards committee? I'll get right on that -- but we'll have to not eat the proceeds.